Dobosh torte, also known as drum torte or dobos torta, is a Hungarian sponge cake consisting of seven layers filled with rich chocolate buttercream, topped with caramel and sometimes coated with ground hazelnuts, chestnuts, walnuts or almonds. 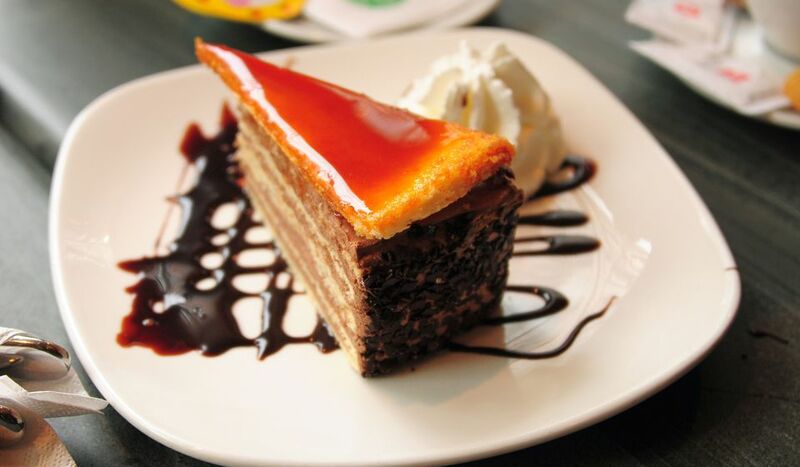 Invented by and named after Hungarian (some say he was Austrian) pastry chef Jozsef C. Dobos in 1884, the elegant Dobos torte is on par with another layered Hungarian dessert, sutemeny Rigo Jancsi. While there are multiple steps to this recipe, this seven-layer sponge cake is broken down into workable categories to help you better plan for preparation and baking. Beat in 4 eggs, one at a time, then flour and vanilla until smooth. Lightly coat the bottom of 7 (9-inch) round pans or bake as many layers at a time as you have 9-inch cake pans and reuse them to bake the rest of the batter with cooking spray. Weigh the batter remembering to subtract for the weight of the bowl. Divide that number by 7 -- this is the number of ounces you will need for each pan in order to create even layers. Bake for 7 minutes or until edges are very lightly brown. Don't over-bake. Remove from oven, loosen layer, and immediately invert onto a cake rack. Melt both semi-sweet and unsweetened chocolates in a microwaveable bowl and set aside to cool. In a large bowl, beat 1 pound butter on low for 2 minutes, then on medium for 3 minutes and finally on high for 5 minutes. Place 5 egg whites and 1 cup sugar in a double boiler over medium heat. Whisk gently to 120 F.
Transfer to a mixing bowl and whip on high until stiff peaks form. Fold the melted and cooled chocolate into the butter. Fold in the egg whites until all traces of white are gone. Place 1 cake layer on a cake rack set over a pan to catch the drips. Mix 2/3 cup sugar and 1/3 cup water in a small heavy saucepan. Without stirring, cook until sugar dissolves. coming to a boil and beginning to darken in color. Swirling the pan, continue to boil until caramel becomes a golden brown. Immediately pour caramel over the cake layer. With a buttered knife, quickly mark the glaze before it hardens into 16 equal wedges without cutting all the way through. Use the rest of the filling to cover the sides of the cake. Sprinkle with ground nuts of choice, if desired. Refrigerate. To serve, slice along the lines marked in the caramel glaze. Place 1 cake layer on a serving plate, or in a 9-inch springform pan to use as a guide, and spread on 1/8-inch of filling. Repeat with remaining layers and portions of filling, and finish with the leftover glazed layer on top. There are two different types of basic caramel -- a wet caramel where sugar is melted with water (as in this case) and a cooked, or dry, caramel where sugar is cooked by itself until it liquefies and caramelizes. This traditional Dobosh torte recipe uses a wet caramel.